Art, Media Design, and Postproduction: Open Guidelines on Appropriation and Remix offers a set of open-ended guidelines for art and design studio-based projects. The creative application of appropriation and remix are now common across creative disciplines due to the ongoing recycling and repurposing of content and form. Consequently basic elements which were previously exclusive to postproduction for editing image, sound and text, are now part of daily communication. This in turn pushes art and design to reconsider their creative methodologies. 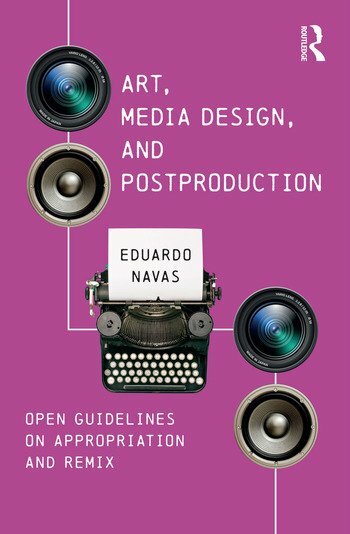 Author Eduardo Navas divides his book into three parts: Media Production, Metaproduction, and Postproduction. The chapters that comprise the three parts each include an introduction, goals for guidelines of a studio-based project, which are complemented with an explanation of relevant history, as well as examples and case studies. Each set of guidelines is open-ended, enabling the reader to repurpose the instructional material according to their own methodologies and choice of medium. Navas also provides historical and theoretical context to encourage critical reflection on the effects of remix in the production of art and design. Art, Media Design, and Postproduction: Open Guidelines on Appropriation and Remix is the first book of guidelines to take into account the historical, theoretical, and practical context of remix as an interdisciplinary act. It is an essential read for those interested in remix studies and appropriation in art, design and media. Eduardo Navas teaches on the principles of cultural analytics and digital humanities at The Pennsylvania State University, researching the creative and political role of recyclability and remix in art, media and culture. He has lectured across the US, and has published two books on remix studies.